As if from the pages of a glossy luxury magazine, this visionary architectural symphony of concrete, glass and steel, tantalizes during the approach, excites upon arrival, and seduces room by room. An exquisite marriage of contemporary form and function, achieving the highest standards of modern design and construction, this property is exemplary in every gesture, element and material employed. Soaring walls of glass create luminous interiors, artfully framing colossal jaw dropping ocean and mountain vistas spanning 100 panoramic miles. 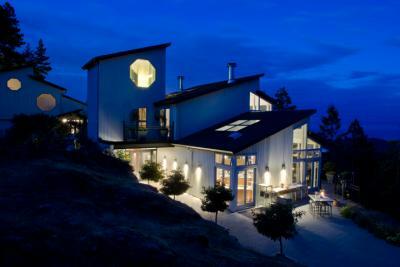 Confidently poised on a mountaintop, this charismatic 7,100 sq.ft. contemporary presides far above the commotion of city life below. The clean lines and transcendent views combine to create a restorative atmosphere of meditative calm. Impeccable attention to detail continues outside with a superior outdoor kitchen, fantastic stone patios, extensive decking, and sophisticated mood lighting. Custom fabricated stainless steel lighting from Germany spans through interior and exterior. Replacing the traditional hearth, suspended fireboxes illuminate, warm, and sculpturally delineate space. The primal heat and colours of fire provide an appealing contrast to the polished concrete floors. Designed with high calibre entertaining in mind, and equipped with every conceivable amenity, this premium fitted kitchen will thrill even the most sophisticated gourmet chef. Featuring custom Canadian walnut cabinets, European hardware, dramatic black honed granite counter tops and the best appliances from Viking, Sub-Zero, Miele, Gaggeneau and Bosch. Aglow in the mysterious azure light of dusk, this remarkable residence offers an intoxicating mix of personalities: sleek yet sensuous, expansive yet intimate, bold yet welcoming. A chic mezzanine lounge above the living room offers extended entertaining and leisure possibilities. Cutting edge yet remarkably comfortable, these unique spaces are the embodiment of living design. Unwavering from the established heights of quality and style found in the rest of the home, two flawlessly appointed private suites assure the absolute comfort of your guests. Complete with hardwood floors, fireboxes, decadent wet rooms, lounges, and individual decks. Delivering beyond expectation, the superb master suite features 30 foot ceilings, spellbinding view-scapes, an abundance of natural light, and an ultra deluxe spa quality en suite. The superb finishes in this lavish open plan wet-room include honed marble counter tops and tiles, and European fixtures by luxury brands such as Zucchetti, Cantu, Geberit, Boffi, Vogue and Balneo/Santos. Musical, artistic...? This house includes 470 sq.ft. studio, awaiting only finishing details, that would make an ideal painting or rehearsal space. Nearby Matheson Lake Regional Park offers extensive recreational activities such as: hiking, swimming, kayaking, fishing, and mountain biking. The famous 46km multi-use Galloping Goose Trail network also passes through Matheson Lake Park, connecting to the adjacent Roche Cove Regional Park. Also, only a short drive away, is the fresh and delectable, award winning cuisine of the renowned Sooke Harbour House. An inspiring combination of man's skilful artistry and nature's dramatic splendour, come experience for yourself the stunning result of pure design alchemy.